“Jamie Oehlers (tenor and soprano saxophones), Stephen Magnusson (guitar) and Ben Vanderwal (drums) are three widely recognised and acclaimed Australian jazz artists, who came together in 2013 to perform each others’ original material in Perth and Melbourne. “The results were undeniably strong – so much so that they are getting back together again in Melbourne to record a new album over this week, with this performance being a prequel to that recording. 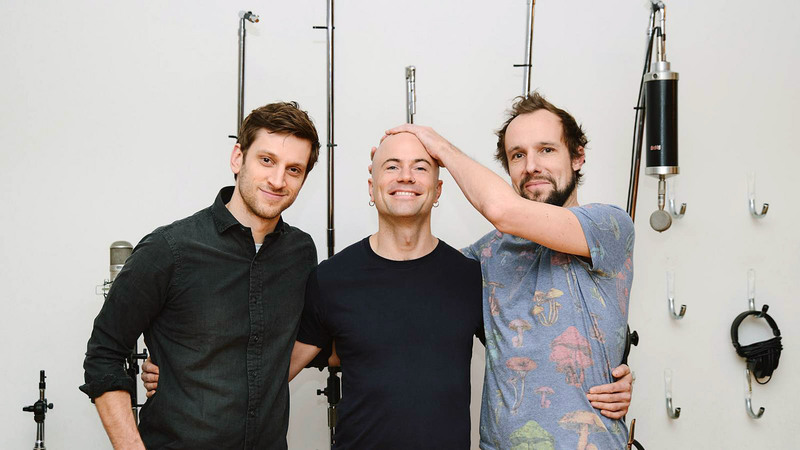 “In 2013 these three fine musicians got together to perform and enjoyed the results so much they coaxed each other to go into the studio and record an album. Once in there, with the red light on they couldn’t stop, they tied the sound engineer to his chair and proceeded to record 15 songs (all available on their new release, Paper Tiger. Paper Tiger features five compositions by Oehlers, three each by Magnusson and Vanderwal, as well as pieces by each of Keith Jarrett, Frank Loesser, Ornette Coleman and Stephen Foster. “Audacious but approachable, eclectic yet focused, Paper Tiger presents a new instrumental trio. No stranger to each other, each member is a highly regarded improvising Australian: guitarist Stephen Magnusson, saxophonist Jamie Oehlers and drummer Ben Vanderwal. “Paper Tiger has compositions by each member of the trio, plus very fresh explorations of other composers’ work – from Ornette Coleman to Stephen Foster. In any international festival the established practice is for the visiting performers, as the main drawcards, to be on stage for much longer and to be preceded by support bands from Australia. This is a good way for our home-grown musicians to share in the festival limelight and potentially gain a following from the larger audiences who appear out of the woodwork. I am always disappointed to notice how many seats that are vacant during the opening set and yet are filled when the main performers come on stage. It is a pity not only because it shows disrespect for Australian musicians, but also because the patrons who arrive late are likely to miss hearing some very talented and inventive artists. The opening sets at MRC this year seem to be way too short. I have not heard any complaints from our “local” musicians — possibly they are glad to have even such limited exposure in such a large festival — but the balance does seem to have swung too much towards the main acts on the bill. In the case of Christopher Hale’s Sylvan Coda, which opened for Jorge Pardo‘s flamenco jazz, what the audience heard and saw was a tiny taste or fragment of the original suite. I’m sure Johnny Tedesco‘s fantastic flamenco footwork was a highlight for many in the audience — I was struck by how his feet called to mind the fluttering of butterfly wings and the feather-light, incredibly rapid work by some drummers I’ve heard — but it would have been impossible to convey the way in which the original suite changed and developed. Anyone who liked the snippet provided in this opener should watch for another performance of the full Sylvan Coda. The other short opening set deserving special mention at MRC so far this year was the performance by Here and Now before the Larry Carlton Quartet. I left a little early from Carlton’s set — to get to another festival gig and also because the music being played did not excite me. But a clear standout for me was the work of Andrea Keller on piano, Nilusha Dassenaike on vocals, Alex Pertout on percussion, Evripides Evripidou on bass and David Jones on drums. I should confess that on this rainy evening I was tempted to arrive at 8.15pm to catch the main act, but decided I should respect the artists performing first. I am so glad I did. Although this set was short, I felt that it took us to quite a special place. Each member of the ensemble contributed significantly, but Evripidou on bass was inventive and I found Keller’s solo, without needing to be loud, filling the auditorium as well as my being. I believed it would be one of the best piano solos of the festival. Her notes seemed to be drawing the audience into a state of total absorption. Dassenaike’s voice was integral to this meditative set. Here and Now musicians take a bow. I’d like to see opening acts given a fairer allocation of time in future festivals. But one thing is certain — it is never wise to come late and miss out on what comes first. It could well be what you appreciate most.